As the Friends of GR Parks and the City of Grand Rapids’ Parks and Recreation Department wraps up community design workshops for eight local parks, what are some trends we can learn from? Starting in late September, eight neighborhoods worked to complete new concept plans for their parks. 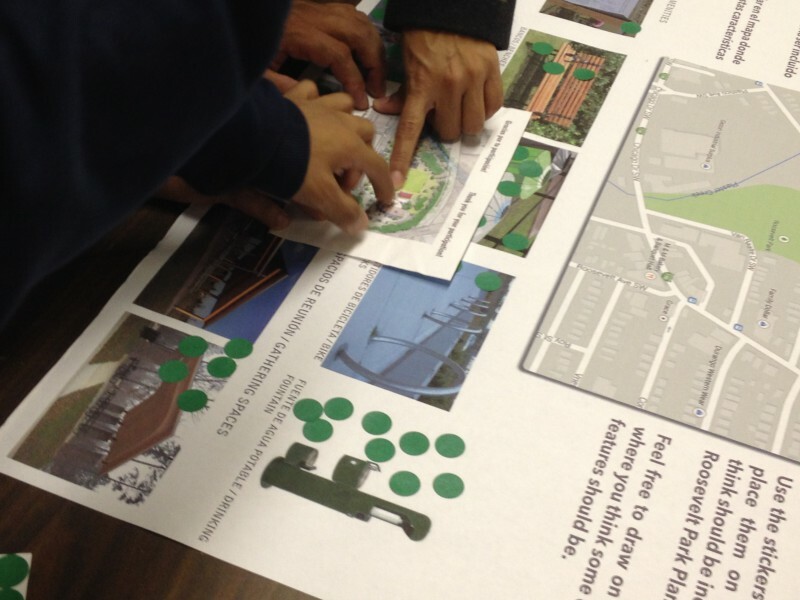 Neighbors, stakeholders, and the broader community were invited to help create and verify park concept plans and identify priority improvement projects. A Neighborhood Planning Team was created for each park that provided initial input, helped to spread the word to neighbors, and helped to prepare for a larger community wide design workshop. VIRIDIS Design Group (and their team of Nederveld, Williams & Works and Lott3Metz) and Progressive AE worked to create a park concept design. All eight design workshops are now complete, and the teams will work over the next month to complete a final concept design, and long term vision, for each park. 1) Tennis is out, and Pickleball and Futsal are in: Demographics are changing. This isn’t a slam on tennis or a suggestion that all tennis courts will go away. However, an aging and a more diverse population now have different recreational preferences and abilities. Pickleball is a racket sport that requires less running and has been embraced by seniors. Futsal is a hard surface game of fast paced soccer. We see these changes also reflected in peoples’ preference for more accessible walking trails, preserving open spaces and trees, more innovative playground design that caters toward a wider age group of kids and has enhanced play value. People want their parks to be multi-generational spaces that draw in the whole community for active and passive recreation. 2) Get rid of a one-trick pony: Whether it’s a hard surface court that can function for multiple games, a field that can be striped in different directions or a plaza that can accommodate different seasonal events, people want flexible spaces that they can imagine for different uses. Even splash pads are being talked about as serving multiple purposes as a plaza and water playground depending on the time of year. This speaks to vibrant communities that want to see various programming and see underutilized spaces activated more often throughout the year. 3) Come Together: Parks are the perfect place to meet your neighbors, but many parks lack some of the basics to foster informal gatherings and make it easier for people to hang out. While they may not be the most exciting amenities, restrooms, drinking fountains, covered shelters, grills, benches and tables all make it easier to be together, more often and for longer periods of time. 4) We’re in this together: There are still many resources and assets around the city that belong to another era. To make some of these resources viable and well used, it will require new funding models and new partnerships for programming. We have shelters and buildings that are tucked back in parks because a groundskeeper used to live there, or a recreation supervisor could watch over kids on the playground all summer. Those days may be passed, but we can still make these spaces work through new community partnerships. Final concept plans for the parks will be unveiled on December 3. The Plan Review Open House, hosted by the Parks and Recreation Advisory Board, will be held in the Gerald R. Ford Academic Center gymnasium from 6 p.m. The Friends of Grand Rapids Parks is coordinating the park design process. Friends is an independent nonprofit organization with the mission of identifying specific park projects, mobilizing people and generating resources to protect, enhance and expand the City’s parks and public spaces.